What is the Difference Between a Regenerative Thermal Oxidizer and a Recuperative Thermal Oxidizer? Home What is the Difference Between a Regenerative Thermal Oxidizer and a Recuperative Thermal Oxidizer? The main difference between a Regenerative Thermal Oxidizer (RTO) and Recuperative Thermal Oxidizer is the different methods they use for heat recovery in the system. Regenerative Oxidizers pass hot exhaust gas and cooler inlet gas through one or more “heat exchanger beds” containing ceramic media. Recuperative Oxidizers pass hot exhaust through an air-to-air heat exchanger–typically through a shell and tube heat exchanger design–to heat the cooler inlet gas. Used to destroy Volatile Organic Compounds (VOCs) such as hydrocarbons, solvents and other hazardous air pollutants, Regenerative Thermal Oxidizers are the most common air pollution control equipment in use today. Regenerative Thermal Oxidizers typically run at higher temperatures than Recuperative Thermal Oxidizers somewhere between 815 °C (1,500 F) to 980 °C (1,800 F) and have better heat recovery efficiency–up to 95%. Epcon achieves this through the use of multiple energy recovery chambers that use ceramic media to store the heat produced to be used to pre-heat other systems. Regenerative Thermal Oxidizers work best when processing low VOC concentrations and require long, continuous operations. Some examples of where RTOs work best are for processes that require ventilation to work properly, such as paint booths, paper mills and printing facilities. Thermal recuperative oxidizers are less commonly used than direct fired thermal oxidizers or regenerative thermal oxidizers, but are a natural evolution of the direct fired thermal oxidizer by adding primary and/or secondary heat recovery to the setup. They run cooler than RTOs, at about 760° C or 1400° F and have a much lower heat recovery efficiency, up to 80%. But they also tend to have a higher VOC destruction efficiency of 99.99% when compared to an RTO that can only produce a 99% destruction efficiency even in the best of conditions. Adding a heat recovery system to an oxidation process can greatly reduce the amount of natural gas used within the process and result in a tremendous savings in energy costs. There are two types of heat recovery used by thermal recuperative oxidizers. Primary heat recovery occurs when the process exhaust vent stream gets directed through a heat exchanger. This crosses the outlet of the oxidizer exhaust, before the inlet to the oxidizer. This recovers (recuperates) heat from the exhaust to pre-heat the air entering the combustion chamber, which reduces the amount of heating necessary for the process, as well as the gas needed to reach oxidation temperatures. Secondary heat recovery occurs when you use waste heat from the oxidizer to support a secondary process such as providing heat for an industrial oven, or wash lines for multi-stage washers. This occurs when directing either fresh air or process air through a heat exchanger, which crosses the outlet of the oxidizer exhaust, and sends it to a secondary process. This recuperated heat from the exhaust is often enough to complete drying or curing operations. The energy savings alone can repay your investment in your equipment in one year’s time. Recuperative Thermal Oxidizers work best for processes where waste liquids need to be treated, for animal feed production, coil coating, and automotive dyno testing. 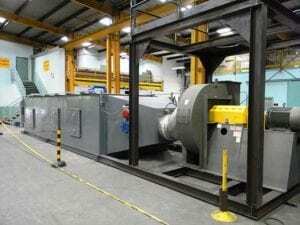 Need a Thermal Oxidizer? Let Epcon Industrial Engineer the Perfect One for You! 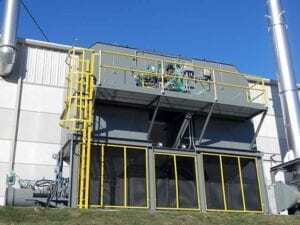 Whether it is a regenerative or recuperative thermal oxidizer, Epcon has over 40 years of thermal oxidizer design experience and knows how to select and engineer the perfect air pollution control system for you. Give us a call at (936) 273-3300, email us at epcon@epconlp.com, or complete our simple online contact form to speak to a thermal oxidizer engineering expert today. ← What is the Difference Between an Industrial Furnace and an Industrial Oven? Interested in saving yourself a few hours worth of critical technical comparison? We do this each and every day. Allow us to explain your options, and together we'll find what system works best for you. Please submit your information to download our application PDF. We will review applications on a rolling basis and will contact you if we feel your qualifications match our current needs. Download our application PDF then email completed applications to careers@epconlp.com or feel free to drop off in person at our Plant location in the Woodlands.